For a series that’s moved from RPG to fighter and back again, seeing Persona move into the rhythm genre of video games honestly doesn’t seem like much of a stretch. And thankfully, everything meshes together well with Persona 4: Dancing All Night on PS Vita. Taking place a short time after the events of Persona 4 Golden, P4’s hero character Yu Nurakami and crew are sucked back into the weird world of shadows and emotional issues that the series is well known for, as they investigate a series of disappearances set against the backdrop of a music festival headlined by their own Rise Kujikawa. The story mode of Persona 4: Dancing All Night doesn’t skimp on the narrative, feeling at times more akin to a visual novel than a rhythm game. The initial introduction might be a bit long for some, but provided you enjoy the series, and these characters in particular, I doubt you’ll mind. Everything is well written, with returning voice actors and characters that don’t stray far from their established personalities. I found it particularly enjoyable to jump back into this world again, and the new characters introduced here manage to do a pretty good job of standing out against the older cast. Overall, the story aspect of Dancing All Night is really well done, and quite lengthy. But how about that whole rhythm gameplay thing? That’s pretty great too. The concept isn’t too dissimilar to older rhythm games like Parappa the Rapper. When the music starts, notes will steam out from the center of the screen along six predetermined paths. Each path corresponds with an icon on the left and right edges of the screen, three on each side. These icons represent face buttons or directional buttons, and pressing the buttons as the note passes through the marker will register the note and add to your high score. As you progress, this of course gets harder and harder, with multiple notes in different directions appearing quickly and simultaneously. There’s also variants on the standard one button notes, like Unison and Hold notes. Unison notes stretch the length of the screen and occupy a button press on both sides of the screen. Hold notes are exactly that, where you hold in the corresponding face button or directional input until the line representing the note finishes. There are also Scratch Rings and Fever Rings, which won’t detract from your score if missed, and are activated by moving either analog stick in any direction. The Fever Rings are particularly useful, as they’ll activate Fever Time, which acts as a limited window with certain bonuses. The background of the playspace is generally occupied by one character, dancing along to the music, occasionally joined by a partner provided you don’t mess up the previously mentioned Fever Time opportunity. The background stuff looks sharp, is well animated, and the dancing ain’t half bad either. It also doesn’t distract from the icons on screen, which manage to pop into the foreground in a way that you’ll never lose track of what’s coming up next to hit. And of course, the music is fantastic. I’m a big fan of Ryota Koduka’s music across most of the games he’s involved with, and Persona 4: Dancing All Night is no different. There’s a lot of familiar tracks here for series fans, but with some really fun and well-done remixes, along with the longer versions of the songs you’re already familiar with. There’s also a decent number of tracks available, in both Story and Free Dance mode. Speaking of Free Dance, there’s a fair amount to mess around with in this mode as well. 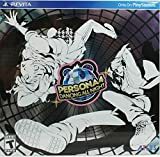 As the name implies, this is where you go if you’re just looking for the rhythm game side of Dancing All Night, complete with songs to unlock, various characters to use, and an in-game shop to purchase new costumes, accessories and more. You can choose different difficulties, change note speed, use power-ups, select partners, and even watch perfect play videos of different songs. Again, there’s a lot to unlock here, which will keep you busy outside of the core Story mode. All in all, I’m super impressed with Persona 4: Dancing All Night. It essentially hits every high mark when it comes to the rhythm genre, while at the same time delivering a great story with a cast of characters that I certainly love. So I’d absolutely urge you to pick this up come September 29th, it’s a PS Vita release you shouldn’t miss.